The Jacob Sheep Breeder’s Association (JSBA) held their Annual General Meeting (AGM) in Dixon, CA. We left late Thursday night and drove through the night to make it a little more comfortable for the 12 sheep that we hauled down. However, sleeping in the front of the truck at a rest area was not very comfortable for us 🙂 My husband drove until he couldn’t drive anymore and we decided to just stop at a rest area and sleep for a little while. Needless to say we didn’t get a lot of sleep! We continued on Friday morning and arrived at our destination mid-morning. We arrived at Meridian Jacobs and helped Robin finish loading stuff in her truck and followed her to the Dixon Fairgrounds. Our sheep and dogs were VERY happy to get out of the truck and trailer. We got everyone situated in their pens and helped other breeders unload sheep as they arrived. Friday’s dinner was delicious and was followed by Dr. Rowe’s Lambing Time talk. It was very informative and I came away with several good ideas – such as using newspaper instead of towels to dry newly delivered lambs. For anybody that has done this knows that the towel is never the same 🙂 We stayed at a friend’s house and it was wonderful! She was concerned that the futon wouldn’t be comfortable, but we assured her that after sleeping in the front of the truck it would be great. The weekend was very full, so we were up at 6:00 to go feed sheep at the fairgrounds and get back to Robin’s for the Pasture talk given by Roger Ingram and Dave Pratt. This was my favorite part of the weekend. We came away with a lot of information and inspiration to make some changes at home. I will be talking about this more in the future. We traveled back to the fairgrounds for lunch and a couple topics covered by fellow Jacob breeder Gary Anderson. These were very interesting and eye opening. 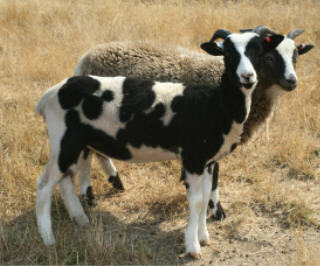 One was the identical twin research they did on Jacob Sheep at UC Davis. They found that horns and color placement are not completely controlled by genetics. It was fascinating seeing sheep that were identical twins that had the same amount of color but not in the same place and the same number of horns but not the same amount of space between the horns. Breeding Jacob Sheep can be so difficult with the horns, color percentage and placement, structure, fleece type, etc. that this was kind of frustrating and good to hear at the same time. If these aren’t completely controlled by genetics than what does control them??? The other research project was on fleeces and whether they have changed drastically since JSBA has started registering sheep. The other part of this was whether or not you can tell what the adult fleece will look like by the lamb fleece. Unfortunately there were big changes found between the lamb fleeces and the adult fleeces. Like I said – very eye opening! The JSBA meeting was next and was very short and to the point. After that was some down time and a chance to chat and look at sheep. Saturday’s dinner was awesome! Robin Lynde donated a lamb and a local Mexican Restaurant fixed it along with chicken, rice, beans, tortillas for fajitas, chips and salsa – YUM!!! Sunday there was a fleece show where my girl Infiniti was awarded Supreme Champion fleece and our lilac boy Yukon was 1st place in his class. After the fleece show was the inspector clinic with Doug Montgomery and Ingrid Painter. It was a lot of fun looking at sheep and hearing everybody’s viewpoint. We left at 1:00 and made it home at 10:30. It was an exhausting, whirlwind trip – but so much fun! Wish I could have been there, one of these years ! I find the genetics so very interesting, and I appreciate the Jacob’s ability to frustrate us when it comes to trying to breed to our standards ! Kind of like weather prediction don’t you think ? Wow I missed alot! Bummer… I hope it is in the West again so we can go. It was a lot of fun, thanks for the write-up, though you made very jealous of Saturday’s dinner and a bit jealous about the inspectors clinic! I wholeheartedly agree with Kathy’s comments about breeding Jacobs being a (using my words) “crap-shoot” 😉 I love that about the Jacobs because they are so unpredictable!